As the Internet of Things continues to develop, smart technology is becoming increasingly integrated and the race to fully converge smart devices is heating up. The humble remote control was one of the first devices to find its way into our homes. Now, it could be at the heart of convergence, providing users with a single device with which to perform synergised functions, controlling everything from the television to your home’s temperature, security and lighting. However, with established technology manufacturers competing against smaller, yet more agile, counterparts, who will win convergence 4.0? While there are a handful of manufacturers most of us will associate with smart home technology, many paid TV operators and telecommunication companies are turning their backs on these devices, thus creating space for some of the smaller brands to rise to the top. Not only are devices created by these big brands more expensive for paid TV operators to deploy, but they are also less adaptable for their needs. Conversely, by partnering up with smaller manufacturers to create bespoke solutions, paid TV operators can be in control of their own destiny and create their own ecosystem on which they can build in the future. This is a fluidity that isn’t offered by larger branded devices where the roadmaps for convergence are already set out for them. Solutions developed with telcos and paid TV operators in mind also allow them to have more autonomy in their approach to the market, rather than following the trends as dictated by large manufacturers. This is a key issue in convergence as with paid TV operators on side, the smaller manufacturers have the potential to tap into different insights and develop new capabilities. Currently, many consumers are turned off by the idea of convergence due to the difficulties they face with configuration and setting up smart devices. For the average person, configuring multiple devices can be daunting and seem like it may require some engineering know-how, which can deter consumers from buying new devices or attempting to integrate them. Difficulties with configuring, discovering and controlling devices are among the biggest pain points for consumers of smart devices and is something that needs to be considered in relation to convergence. It is vital that manufacturers and industry leaders address these pain points in order to make convergence and configuration a friction-less and simple process for the end user. This is also likely to lead to increased uptake of smart devices. Users require intuitive devices which are capable of automatically recognizing new devices and help the user to configure them. However, many of the key players within the industry are yet to offer devices capable of this. Should manufacturers, and the bigger market challengers such as Amazon and Google, want to attract audiences, the need for end-to-end solutions which simplify the process of migration to the smart home for the end user needs to be considered. For example, devices should offer simplistic, voice-based processes to increase ease of use. Additionally, the winner of convergence 4.0 will produce devices which are capable of ‘learning’ set skills. As well as being intuitive in recognizing other devices, these devices must also intuit what a user requires when they perform certain commands. For example, ultimate convergence will come when users are able to ask their device to enter ‘movie mode’, for instance, and the device will not only play a movie but will also draw the curtains and dim the lights. It is our view, that as many smart devices make use of voice-control, the two issues are intrinsically linked. Therefore, to win convergence 4.0, you must also be one step ahead in the fight for the voice-assistant market. The uptake of voice-controlled devices is growing significantly with a recent study finding that 1 in 6 adults in the US now owns a voice-activated smart speaker and 65% say they wouldn’t want to go back to a life without these devices. Their popularity and ease of use show that this technology should be a key feature for the future of convergence. Given the current difficulties associated with configuring devices, the real winner of convergence will be the company that can make integrating these devices into the home it as easy and seamless as possible. At the moment, convergence is currently being driven primarily by the market as a pre-emptive strike to anticipate the needs of consumers. While the big names currently have a monopoly on this market, convergence 4.0 could be a case of the tortoise and the hare as smaller manufacturers step up their approach to the market. With a more insightful view of the requirements of not only the user but also telecommunication companies, these brands could be better able to tailor their offerings more precisely to suit the users’ needs. Customer Story – 650 Hours Saved in Just One Week! Following is a snippet of QuickSet Data Insights, covering the first week of a major cable provider in Europe going live with a next-generation entertainment platform powered by QuickSet Cloud. These insights enable data driven decision making; leading to the refinement of products. QuickSet Data Insights, powered by Device Knowledge Graph , is one of the benefits of using QuickSet family of products. This enables our customers to take intelligent actions based on quantifiable data about their consumers' installed base. With a data driven culture, we also leverage these points for measuring QuickSet's success and prioritizing features. 94% of the households automatically set up their devices with zero manual intervention, powered by QuickSet device discovery and fingerprinting technology. 98% of these successful setups are able to directly tune to content with a single touch. Read more about this feature here. Above resulted in drastic time savings for consumers. How drastic? considering a manual, user-driven setup takes on average 5 minutes, automatic setup saved the cable provider consumers over 650 hours in the first week alone! Automatic setup saved the cable provider consumers over 650 hours in the first week alone! The market remains fairly fragmented; however, the top two brands dominate the majority of the market share, holding ~65% of the installed-base market. With more than one-third of the customers having TVs older than 5 years, and 20% of customers having 2017 model-year TVs, proper support and handling for both legacy as well as new devices is essential. Despite the proliferation of devices in recent years and the rise of over the top boxes, “input 1” remains dominated by service providers, with ~ 60% of the newly launched cable boxes, connected to input 1!! It is hard to read an industry article or report these days that does not mention the rapid growth of voice control and voice based technologies leveraging artificial intelligence. Parks Associates in a recent report named voice as a prime differentiator in the user experience for the smart home. As the number of devices consumers interact with in the home has increased, so has the complexity in user experience and voice as a natural easy-to-use interface is helping to alleviate complexities in the user experience of today’s smart home. Despite the fact that several companies have introduced voice-controlled personal assistants, the market remains largely dominant by two major players: Amazon and Google. A report released by Consumer Intelligence Research Partners, LLC (CIRP) in August, indicates that within the US installed base of devices, Amazon Echo and Google Home make up 94%. Another report by Canalys published in August, analyzes the global market of smart speakers and estimates that Google and Amazon accounted for 57% of the global market. With smart speakers having a global market growth of 187% in Q2 2018, it is only natural for product manufacturers to be eager to integrate with these solutions to gain a competitive advantage by adding voice capabilities to their products. Voice technology enables brands to connect with consumers in a personal way while addressing complex tasks through a natural interface. At the same time, these existing platforms pose serious risks to brands, and despite the compelling new experiences that they enable, incumbent brands will need to find ways to deal with the loss of control over the consumer interaction and the brand experience provided. Lack of control over the conversation with the consumer, as well as the pivot of brand loyalty to the platform used for voice control all contribute to the difficulties for brands to compete. Lack of control over the conversation with the consumer, as well as the pivot of brand loyalty to the platform used for voice control – ‘Hey Alexa’ or ‘Hey Google’ – all contribute to the difficulties for brands to compete. One solution could be that , consumers would use multiple virtual voice assistants for varying needs and the home becomes an ecosystem of different assistants rather than a single platform. Brands that realize this early on and start offering their own virtual assistant for the niche experience they provide, will have a competitive edge. As voice control has become essential, a growing number of brands are experimenting with introduction of their own apps on these platforms - referred to as “skills” for Amazon Alexa, “actions” for Google Assistant - to utilize the reach of already dominant platforms. These in theory enable brands to engage with consumers through an existing virtual voice assistant and enable interesting use-cases for the connected home. According to CIRP, the current U.S. installed base of smart speakers has hit 50 million. Despite the large number of installed base, consumers engage with them for very limited use-cases. Parks associates lists primary activities using these virtual voice assistants as requesting information, finding direction, playing music, making calls and such; with control of the devices being the least popular use-case. To some extent, consumers not fully utilizing these capable platforms can be contributed to the hurdle in discovering and setting up the added capabilities, skills or actions. The number of these skills is exploding and discovery remains a big barrier for consumers. Once discovered, setting up the platform to utilize the skills is also a cumbersome, multi-level process that average consumers will not go through. The idea of growing the installed base and reducing the friction on adding additional capabilities to existing voice platforms has the potential to increase the engagement; and though it is showing improvement and promise, there’s still a long way to go. Adopting QuickSet's device discovery engine capabilities into smart speaker solutions, can help with the friction of discovery and utilization of relevant skills. Imagine a smart speaker platform that's capable of identifying a specific brand within the home and then prompting the user to install the corresponding skill. This can drastically improve consumers' utilization of brands' skills. As discussed in more length in a recent blog , Interoperability: The cornerstone Of Connected Home , interoperability is a major factor in the connected home. When it comes to compatibility with the devices within the home, today’s available platforms only address a small subset of devices and remain focused on cloud service integration to achieve limited control capabilities. Ultimately today’s voice activated AI capabilities fall short in providing features needed for interacting with what consumers already have in the home and do not address the prioritized list of what they are spending majority of their time at home doing. With adults spending nearly six hours a day consuming video across platforms, one would think compatibility with the existing entertainment devices within the home would be one of the first use-cases these platforms should address. 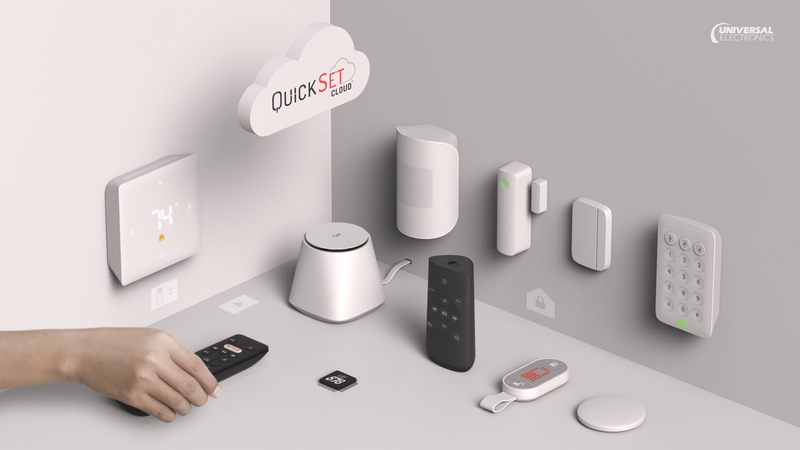 QuickSet, leveraging its device fingerprinting technique and tapping into its constantly growing knowledge graph of devices, enables compatibility with new as well as existing devices within the home. This technology is a natural addition to the next generation of AI driven voice assistants to address this limitation.